An award-winning arts and culture blog. As you probably gathered from my previous post, I was excited about reading The President Is Missing. Unfortunately, after reading 10 chapters, I lost interest in the book. It failed to capture my attention because nothing compelling occurred in the first 10 chapters. Something shocking has to happen in the first chapter of a thriller so that it makes me want to keep turning the pages to see how it all comes together. Unfortunately, it seems that Bill Clinton’s influence on this book was to the story’s detriment as it moves at a snail’s pace and is bogged down by political jargon and details that get in the way of the James Patterson’s normally fast-paced writing style. I made a decision a few years ago to stop reading books that aren’t good. I realized that there is no need to waste hours of my time on a book that isn’t enjoyable. To my disappointment, The President Is Missing is one of those books. Lisa Scottoline is one of my favorite authors and I love reading her domestic thrillers that are released every spring. Her latest, One Perfect Lie, is a solid thriller. However, I didn’t find it nearly as compelling or satisfying as her previous work. I just finished The Games by James Patterson and Mark Sullivan and it was excellent. This novel was perfectly timed as it deals with two major sporting events, one of which is right around the corner: the 2016 Summer Olympic Games. There are two parallel storylines at play in this novel, neither of which I’ll divulge in my review because I don’t want to spoil either of them. However, I can tell you that the storylines are compelling and that both are brought to satisfactory conclusions. As with all of James Patterson’s thrillers, the pacing in this book is tremendous. The pages fly by and no words are wasted. Every page and chapter move the story and the characters forward, toward the novel’s thrilling climax. The Games is one of my favorite James Patterson books, and I highly recommend it. Rio de Janeiro, Brazil–home to beautiful white-sand beaches, gorgeous women, stunning natural beauty, and the world’s largest Carnival celebration–knows how to throw a party. So it’s a natural choice to host the biggest spectacles in sports–the World Cup and the Olympics. To ensure that the games go off without a hitch, the organizers turn to Jack Morgan, the unflappable head of the renowned international security and consulting firm Private. But when events are this exclusive, someone’s bound to get left off the guest list. Two years after the action nearly spilled from the field to the stands during soccer’s championship match, Jack is back in Rio for the Olympics. But before the cauldron is even lit, the only thing more intense than the competition is the security risks. When prominent clients he’s supposed to be protecting disappear, and bodies mysteriously start to litter the streets, Jack is drawn deep into the heart of a ruthless underworld populated by disaffected residents trying to crash the world’s biggest party. As the opening ceremonies near, with the world watching in horror, Jack must sprint to the finish line to defuse a threat that could decimate Rio and turn the games from a joyous celebration into a deadly spectacle. This fall Lee Child’s 21st installment in the Jack Reacher series, Night School, is being released. For those of you Reacher Creatures needing a Lee Child fix between now and then, check out the two videos I shot below of Lee from last year’s event at the Free Library of Philadelphia where he was interviewed by best-selling author Linda Fairstein. The first video is Linda interviewing Lee and the second one is Lee conducting a Q&A with the audience. Enjoy! 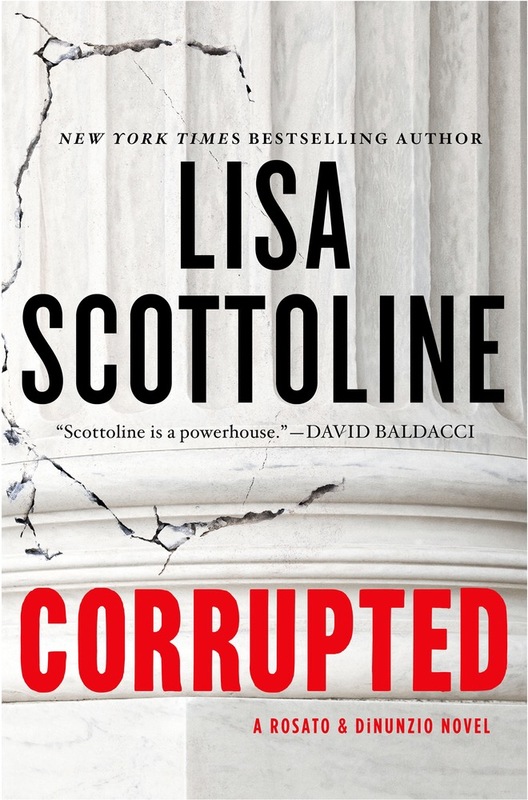 Last night I stayed up late to finish Corrupted by Lisa Scottoline; I’m glad I did because it was the best legal thriller I’ve ever read and one of her finest books. What made this novel so compelling? Well, for starters, it featured excellent character development. From the protagonist to the client she represented, nearly all of the key players in the book faced realistic internal and external struggles that made them relatable, mature and human. I also enjoyed the romantic subplot and how it intersected with and influenced the main storyline. It was tastefully written and heartfelt, and I’m eager to see how it evolves in future novels in this series. Corrupted has an interesting structure as well, with portions of the book taking place in the past and others in the present. Scottoline wisely doesn’t jump back and forth more than necessary, and events that take place in both time periods are seamlessly woven together as Corrupted escalates toward a thrilling climax that is unpredictable, plausible and immensely satisfying. If you need a new book for the new year, pick up a copy of Corrupted. It’s a finely crafted tale that makes one thing clear: Lisa Scottoline is at the top of her game. Well, kind of. A couple days ago when I downloaded the Dragon Anywhere app on my iPhone – which I’m using right now to write this blog post – I decided now was finally the time to start outlining my novel. What will it be about? I can’t say just yet. How long will it take to write? Who knows. All I know is that it won’t get done if it doesn’t get started. One of the things I’ve learned from the myriad of successful authors I’ve interviewed and befriended over the past several years is that outlining a book before you write it can be incredibly helpful. I’ll keep you posted on how my journey is progressing and any key milestones along the way. I recently read Eyes Wide Open by Andrew Gross and it was terrific. The story is fast-paced, the characters are well-developed and it kept me on the edge of my seat from start to finish. My only complaint about the novel is the ending. It ran too long, concluding with a cliff hanger, leaving it open-ended for a potential sequel. It would have been far more satisfying for it to have ended after the climax came to a close. Instead, it dragged on too long and left me confused and disappointed. Despite my distaste for how Eyes Wide Open ended, I still recommend that you read this book because it’s well-written, compelling and full of suspense.